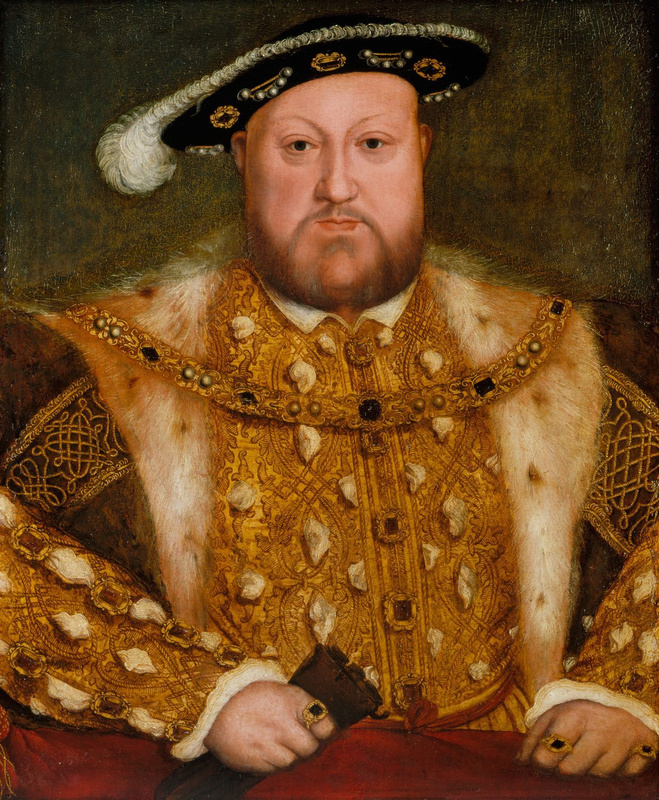 Henry VIII was partial to wearing Cloth of Gold – this was fabric woven from thin strands of gold, and in this lovely portrait by the marvellous Hans Holbein, we see it encrusted with real jewels, fur, velvet, silk and amazing embroidery. As if he was not big enough already Henry, like Royalty in general, wished to show through his clothes not just his outrageous wealth, but also as the biggest and best man in his Kingdom. Gold, in reflecting light, and being the colour of the sun, was the most glorious shade for the head of the nation and the church. Also, gold was Henry’s colour. His red-gold hair and warm colouring were enhanced by wearing gold. This association with greatness – in terms of superiority over all others was exploited by many others throughout history. Two that come to mind are Elvis Presley and Marilyn Monroe, both of who deserve to stand out, perhaps, as the most desirable pair of their generation. By draping themselves in gold cloth they managed to indicate their potency, wealth and talent to the world. In these garments the fabric used was not real gold thread, but a modern invention (from around 1920 I believe) known as gold lamé. This is a wrapped warp thread made from a very shiny, tinselly ribbon, woven into silk, wool or rayon. This fabric was mass produced during the fifties and has been fairly popular for evening wear since then. 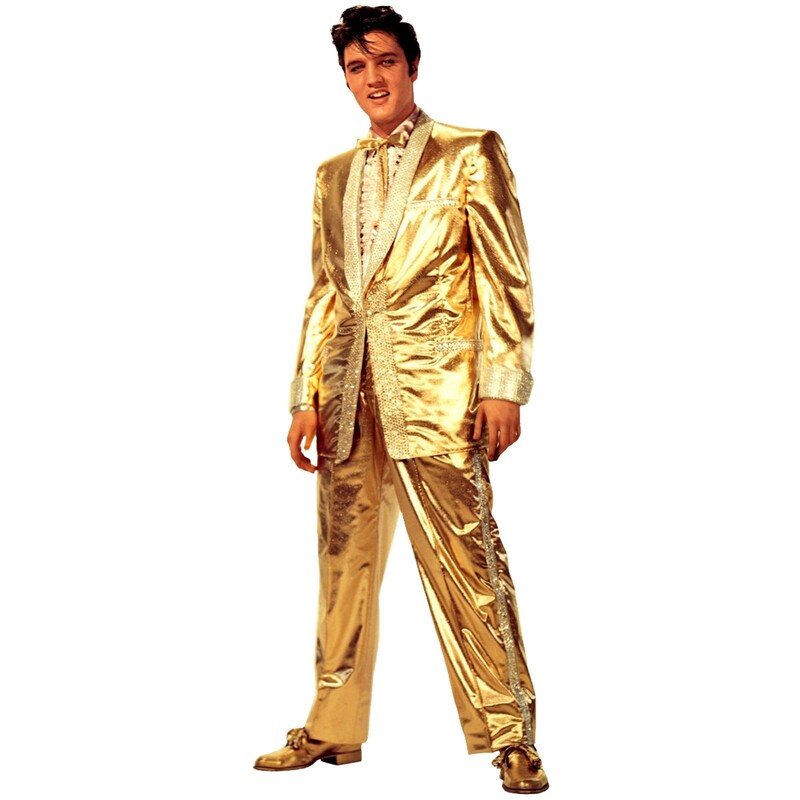 Elvis’s suit was made by Nudie Cohn and worn for the first time in 1957. He found the trousers too heavy and said the fit was not too good. Also, as he liked dropping to his knees when performing, the fabric did not wear well. He prefered to wear the jacket with black trousers. In this photograph everything he is wearing is gold including his kid shoes, shirt, belt and bow tie. The outfit is encrusted with Rhinestones – rather than the real gemstones in Henry’s outfit. Nudie Cohn was famous for making the Rhinestone cowboys outfits, as well as Janis Joplin and many others, and this one was reputed to have cost $10,000 (although it actually cost $2,500). This dress, worn by Marilyn in Gentlemen prefer Blondes was designed and made by William Travilla. It was cut from a single circle of gold lamé, pleated with sun-ray pleats. It is apparently strengthened with two flexible iron bas in a a V shape that start at the waist and radiate towards the bust, ensuring that the dress moulds to the body. Marilyn was sewn into it for the film and it appears just for a few moments. It doesn’t have a “zipper”. If you are a night-club singer, a ballroom dancer or rather eccentric you may already have something in gold lamé. It is a showy and rather uncomfortable fabric. If you suit bright and warm colours you could certainly get away with shiny gold T-shirt or cardigan if you wanted. Personally I prefer gold (and other metallic) for details instead – shoes, belts, glasses and jewellery. Here the material will be leather or metal and more comfortable and durable as a result. People with muted, deep or light colouring who are neither warm or cool can wear gold or silver as they choose, but probably not on a grand scale.